What is meant by the “change-over” switching function with pressure switches? A pressure switch with the “change-over” switching function represents a special version of a pressure switch with two switching outputs acting oppositely to switch two circuits. A “change-over” closes one circuit and simultaneously opens a second circuit. Thus a “change-over” simultaneously fulfils the function of a “normally open” and also a “normally closed” contact. This means that, in operation, a “change-over” can only ever have one connected circuit closed and one energised. “Change-over” contacts are used to a much lesser extent in industrial applications than the traditional “normally open” and “normally closed” variants. However, many applications with simple safety features can be implemented with “change-over” contacts. Let’s look at simple machine monitoring, e.g. a coolant unit on a machine tool with visual fault indication (see figure). A pressure switch with a “change-over” switching function monitors the coolant supply to the tool. 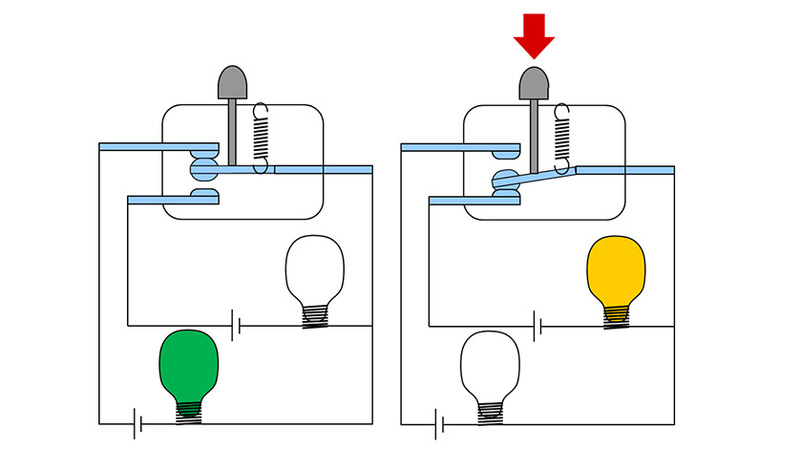 If the supply pressure of the coolant is sufficient, then the switching circuit for a green light is made (green light “on”). If the pump fails, however, and the supply pressure of the coolant drops off, then the switch changes its switching status. It opens the switching circuit for the green light (green light “off”) and simultaneously closes the switching circuit for the yellow warning light (yellow light “on”).Thus the machine operator gets a direct visual feedback of any interruption at the coolant supply unit. Naturally, with the appropriate connection, the “change-over” could switch other connected loads in place of a warning light, which could, for example, shut the machine down or sound a warning hooter. Through an ever-increasing level of automation, even in simple machinery, in the last years there has been a greater use of mechanical switches with “normally open” and “normally closed” as redundant safety monitoring for the continuous monitoring with sensors. The latest developments in modern electronic switches offer the operator, through the simultaneous provision of switching and analogue output signals, a far greater range of opportunities in the design of safety control. Thus, a control with the assistance of electronic switches can − through the analogue signal − continuously monitor system pressure, temperature or level, while also, at the same time − through the evaluation of the switch contacts − fulfilling an independent safety function through the monitoring of critical states, whereby hazards to personnel and machinery can be prevented. Apart from “change-over”, manufacturers of switches offer a variety of switching functions for all applications, such as “normally closed” or “normally open”. With the aid of these switching functions, operators can fulfil almost 100 % of all simple control and safety tasks within machine building. Further information on mechanical pressure switches and electronic pressure switches can be found on the WIKA website. Should you need any advice on the selection of a suitable switch, your contact will gladly help you. What is meant by the “normally open” switching function with pressure switches?